"So why send the King Barons?" Paskin, King Baron is a Baron of the House of Kings. He and Vekis, King Baron are sent to King's Watch to meet with Yavek, Wolf Baron, a representative of the House of Wolves, to discuss Skolas, Kell of Kells' proposal to unite all of the Fallen Houses under his banner. Paskin is encountered in the mission The Ruling House, where all three Fallen nobles attending the meeting are defeated by the Guardian. Prince Uldren Sov believed that Paskin and Vekis only attended the meeting to assassinate Yavek, which would have been a firm dismissal from the Kell of Kings of Skolas' ambitious plan. Whether or not this is true may never be known due to the Guardian's interruption. 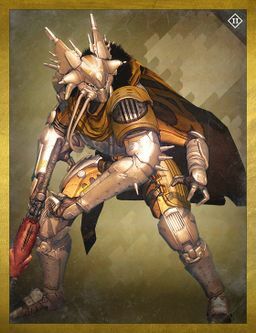 Paskin is the third House of Kings leadership besides Vekis, Physkin, King Baron, and the Ultra Captain that appears in Destiny.